These records cover operations of the European Theater during World War II, as collected, maintained, and organized by the Army's historical division staff. 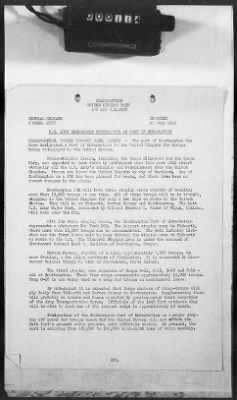 Records of the U.S. Army's European Theater of Operations (ETO), 1942-1946, are from NARA's Record Group 498. They include essentially all administrative, strategic, and other documents relating to U.S. operations in Europe during World War II. They were filed within folders, later microfilmed, and now presented on Fold3 as digital images. The first series of folders are by subject, then by miscellaneous files, monographs, staff section reports, geographical command reports, and miscellaneous reports.